A cardboard house. Yes, yes, you read it right! And that’s what Wikkelhouse’ literally means in Dutch. The idea sounds crazy, but it’s actually genius. This modular and recyclable house is as solid as it is efficient. At 3900€ a module, a small house can be built in a day. And shelter a home for 100 years! But then, how does it work? A Wikkelhouse, literally a “cardboard house”, has already travelled from Amsterdam to Marseille! Installed in April 2018 in the Phocéenne city, it is one of the first forty habitable cardboard houses. 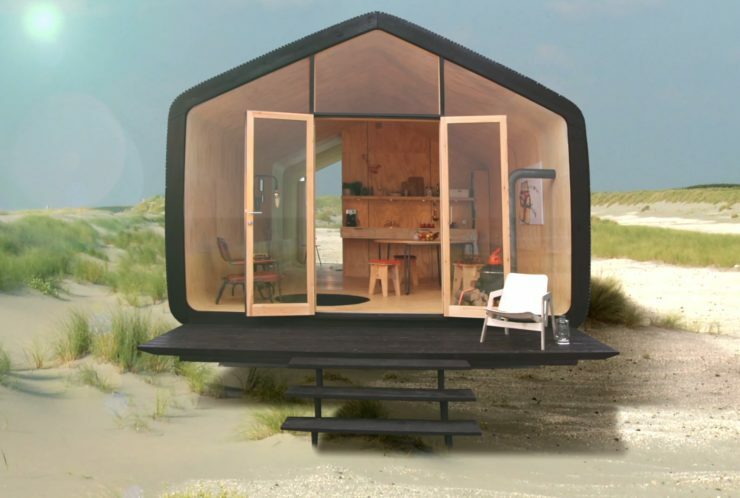 And the design of these modular mini-homes is far from what one could imagine of a construction in this material. The design is refined, in a Scandinavian style, with ultra-modern light wood finishes and a large bay window. If you don’t know the house was built out of cardboard, you can’t guess! Currently, only one company manufactures cardboard houses: Fiction Factory, whose workshop is located in Amsterdam, the Netherlands. The founder, Oep Schilling, 54, defines himself as a “creative maker”, i.e. an inventor anchored in the concerns of his time. To combine ecology, comfort and aesthetics to create the homes of tomorrow. If the Wikkelhouse has seen the light of day, it is thanks to the invention of another Dutchman René Snel, at the head of a packaging company in the 1990s. Challenged to build a light and inexpensive house to respond to humanitarian crises, he created a rotating machine that sticks 24 successive layers of cardboard. It allows him to build a basic module of a dwelling 1.2 meters wide by 4.6 meters long. That’s 5m² and 500 kilos! The modules can then be assembled and customized. If René Snel has succeeded in his bet, his machine has fallen into oblivion. Until Oep Schilling discovered her in 2012 and decided to continue her compatriot’s adventure. It is in 2017, after four years of tests, that the first house is marketed. And the ecological aspect has been integrated into the entire production chain. Both cardboard and wood come from ecologically managed forests with the FSC label. The glue is water-based while the waterproof coating lets the house breathe. The latter is guaranteed for ten years but its lifespan is estimated between fifty and one hundred years. It is 39 000 € for a module of 50 m² and 70 000 € with all layout options. Installation time? One to two day(s) depending on dimensions ! And, don’t worry, you’ll find all the modern comforts: equipped kitchen, bathroom with shower or bath, etc.. The heating is done with a wood stove, which brings very quickly a pleasant temperature in all the housing. The Wikkelhouse is therefore ecological (three times more than a traditional house!) and inexpensive. But that’s not his only advantage. The thermal and sound insulation is excellent at no extra cost. Moreover, this house has the advantage of not requiring heavy foundations. It can be easily installed anywhere: in the garden, a corner of the forest, a beach, a canal, etc. And it can easily adapt to changes: modules can be added or removed without any problem. Very close to the Tiny house but much easier to build for a similar cost, the Wikkelhouse is likely to seduce the followers of small alternative habitats. Fiction Factory currently delivers its modules to the Netherlands, France, Belgium, Luxembourg, Germany, the UK and Denmark. The Wikkelhouse seems to have all the assets to revolutionize ecological and modular housing. All that remains to be seen, over time, is whether this house holds up. If she does, she’ll definitely be a hit. Today, modular homes have taken on unique shapes, are made of stronger and easier to work with materials, and contain design elements (if desired). Lighting, décor, landscape and even durability influence how manufacturers create these amazing prefabricated structures. This is the case of wikklehouses, pentagon-shaped houses developed by a Dutch company. A contemporary office or a holiday home? Temporary accommodation or an exhibition room at a fair or festival? The Wikkelhouse has everything you need. Innovation often comes from the application of knowledge from one field to another that is unrelated. That’s exactly what happened with this modular wonder. The Wikkelhouse was designed and built by a small Amsterdam company. The term wikklehouse is therefore a flexible concept. Individual segments are linked together in a house, trade fair stand, showroom or office using invisible links. The base of the Wikkelhouse is made of cardboard of virgin fibres, made from Scandinavian trees. The cardboard is wrapped around a huge mould, using a patented method by RS Developments, while adding environmentally friendly glue. This creates a strong and insulating structure. Through this packaging process, a method of thermal insulation and construction is integrated in a sustainable way. Each segment is then covered with a protective film and wooden battens. The Wikkelhouse meets the criteria for temporary or permanent accommodation. It is about eight times more durable than traditional construction. The Wikkelhouse can be placed during the day and can be supplied with glazed or closed facades. It is a unique and contemporary design, which creates living spaces, unique and creative. The simplicity of its design is fascinating. The solid glass façade is a sign of modernity while the round characteristics remind you of the high quality and excellence of the execution. From the side, it is obvious that this is a modular building. The 1.2 m wide sections are clearly visible as no attempt has been made to hide the dividing line between the modules. Interior: Smooth plywood panels surround the entire building and give the house a unique appearance and an impression of superior quality and strength. Even from the inside, the dividing lines between the modules are clearly visible, adding depth to the interior space. In theory, there is no limit to the number of modules you can add. In addition to an exceptional look and unlimited scalability, the Dutch have designed a specialized module for the bathroom and a module with a round window, as well as accessories for the kitchen, living room and heating. This creates a custom version of the Wikkelhouse. This modular concept is super simple yet remarkable. The whole house is installed on a concrete block and wooden beam structure. The house is very light and, thanks to this particular characteristic, the frame can be placed on a level and compacted ground, requiring no foundation. This reduces installation costs and installation time. This house is made of cardboard! Whether you believe it or not, each segment is built by “rolling” a tiny sheet of cardboard on a steel frame. The whole system is absolutely ingenious! The manufacturer reports a wall U-value of approximately 0.29 W/m2K (R = 3.5). The U-value of the windows is approximately 0.24 W/m2K (R = 4.2). The 1.2 m wide cardboard sheet is wrapped around the frame while 60 lines of glue are “drawn” on the sheet. The glue joins the layers together and connects the entire structure into a solid block. Once the adhesive has hardened, the steel framework is removed and the segment is ready for finishing. Transporting a Wikkelhouse is relatively simple. Thanks to the standard module size of 1.2m, two modules can be transported side by side, for a total depth of 2.4m. The set of two modules fits perfectly to a truck. In the width direction, a standard trailer can also carry two modules. In total, up to four modules can be loaded onto a standard truck. The size of a Wikkelhouse composed of four modules would be 4.6 x 1.2 x 4 = 22.08 square meters. Once on site, the modules can be unloaded with a regular forklift and placed directly on the foundation frame. The operation is very simple and, unlike most modular systems, does not require a crane. Once in place, the modules are fixed in place and the structure is finished from the outside with the addition of wood siding. Once assembled, the house is already finished inside and the owner can move in immediately. The only drawbacks seem to be the availability and the fact that you can’t customize the architecture of the house. The only things you can customize are minor details like colors and the presence of windows, but the shape of the modules is fixed and they can only be assembled in a straight line.